Most organizations have built at least a few mobile apps at this point. Once employees and customers have adopted the first set of apps, the floodgates open and demand for mobile apps and business processes quickly outstrips IT’s ability to scale its initial development efforts. At this time, the challenge for organizations is creating a framework that allows the technology team to scale its development efforts rapidly. The maturing cloud computing landscape has provided new tools to help companies scale development and application innovations. 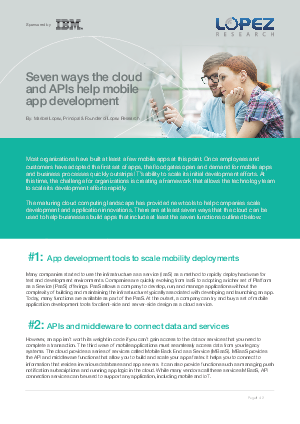 There are at least seven ways that the cloud can be used to help businesses build apps that include at least the seven functions outlined in this whitepaper.